It’s easy to get lost when you’re shopping for a brown diamond. With trade terms like champagne diamonds, chocolate diamonds, and even cognac diamonds, you have to wonder—are we all talking about the same thing? The answer is, yes and no. Here we will address each trade term and explain the color range it covers as well as what it means. Brown is the technical and least confusing categorization used for any colored diamond with the body color brown. This includes all brown diamonds whether they are Pinkish Brown, Orangy Brown, Purple-Brown or just pure Brown. This sounds simple enough, so you may wonder–why are there so many names for brown diamonds? The color brown is often thought of as unattractive. It’s common, it’s the color of dirt, and plainly speaking, it’s just a lousy marketing idea to label something of high value “brown.” But champagne, like diamonds, is high class. Also like diamonds, champagne is used to celebrate exciting life moments. Most people use “champagne” to refer to all brown diamonds. On our site we call our brown diamond section, champagne. Not to add confusion to this, but there are some people who only use champagne to refer to light brown diamonds. These people will save dark and orangy brown diamonds for the category “cognac.” View our collection of stunning champagne diamond engagement rings to find one you’ll love. This classification is sometimes used for orangy brown and dark brown diamonds. The color in cognac diamonds is always rich and always warm. Perhaps because the definition is so narrow, it is one of the least popular trade term used for brown diamonds. Even less popular are cinnamon diamonds which have overtones of pink and clove diamonds which have overtones of green. So far we have the catch-all term brown diamonds, the sometimes narrower term champagne diamonds, and the definitely narrowest terms clove, cinnamon, and cognac diamonds, which lead us to the one we haven’t discussed yet–the most popular name for brown diamonds. 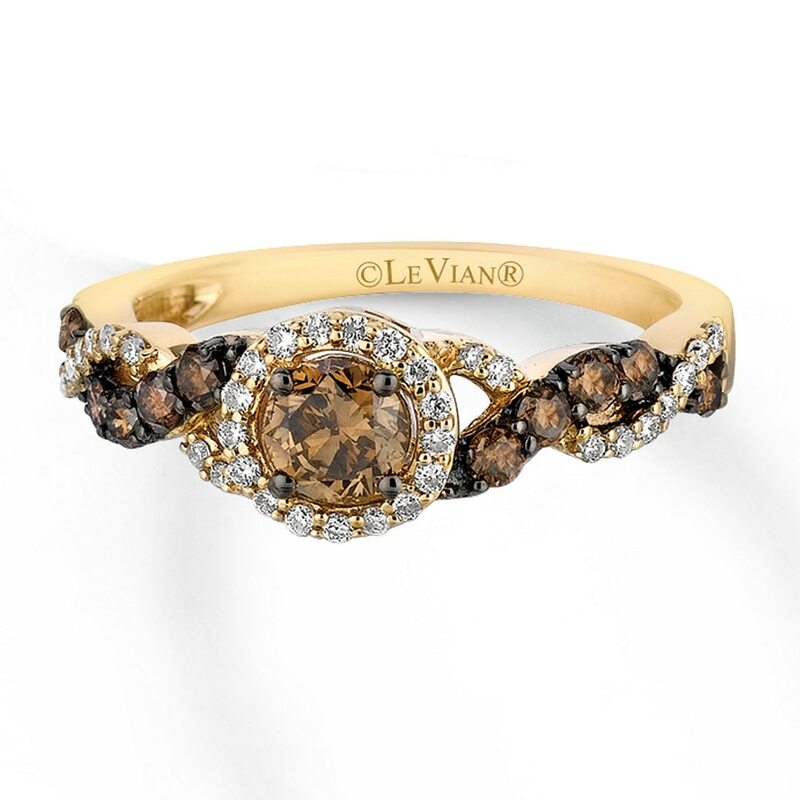 Chocolate diamonds is a trademarked name by Le Vian for brown diamonds. This brilliant marketing idea helped turn the reputation of brown diamonds around. Once thought of as undesirable, they are now exciting gifts for everyone. Whether you like to call it champagne, cognac, cinnamon, clove, or chocolate, a brown diamond is an excellent diamond for everyday jewelry. And as it increases in popularity, it is becoming a trendy choice for engagement rings and wedding bands as well. The best thing about buying a brown diamond is that it won’t break the bank! Even a large 1.51 ct. round brilliant fancy orange-brown diamond with excellent VS1 clarity can be bought for $3,926. That’s $18,124 less than the equivalent 1.51 ct. round brilliant VS1 colorless diamond (D color)! This makes brown diamonds excellent “starter diamonds” for the girl looking to start a fine jewelry collection. As a pair of diamond studs, a solitaire pendant, or even an incredible engagement ring, brown diamonds show their versatility and bring that signature diamond sparkle within everyone’s reach. Visit our fancy brown diamond guide to learn even more about these cool jewels. One Response to Is There a Difference Between Brown, Champagne, and Chocolate Diamonds?